Ho, Ho, Ho, Christmas is fast approaching! 🎄🎅 I hope all of you are having a great time and enjoying the Christmas season. I have at least a favorite radio channel on SirusXM playing Christmas tunes as I drive Nikolai to school and back. 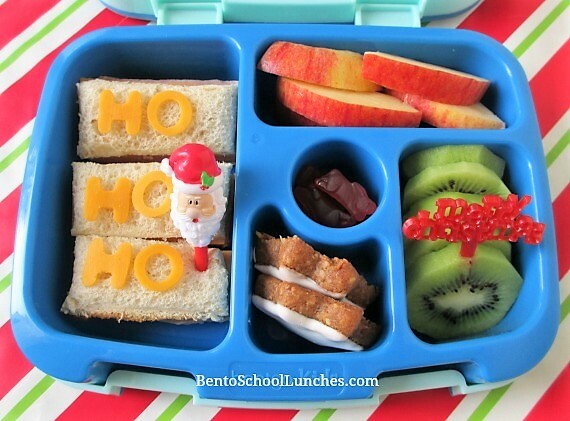 Today he took along this Ho, Ho, Ho bento. Hey, that almost sounds like a cheer. Again, I kept things simple and easy, yet I hope fun for him. The three section sandwich has the HO, HO, HO of mild cheddar cut with our alphabet cutters and a Santa pick. I included some apple slices, frosted gingerbread stars from Trader Joe's and some slices of kiwi fruit with a Merry Christmas pick. In the small section in the middle are some Annie's organic fruit snacks. This lunch is packed in a Bentgo lunchbox. Concerts and lots of other fun activities are just ahead, so this will be the last post of the year. I truly hope you also have had a fun year and that the new year will be even better! From our family to yours, "Merry Christmas and Have a Blessed Holiday Season."